Seeing is believing. 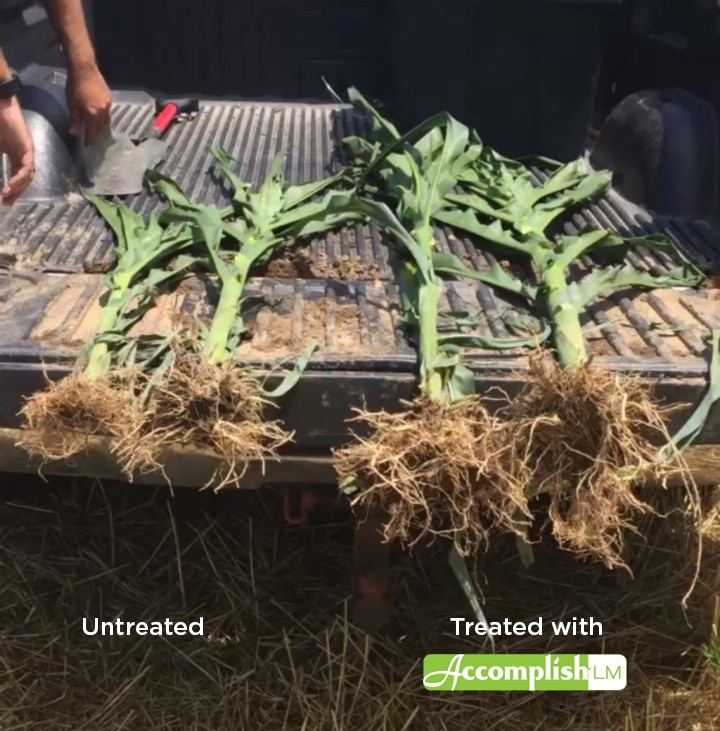 These corn plants in Central Indiana show an increase in plant growth and root mass where Accomplish LM is included in the grower's starter fertilizer program. 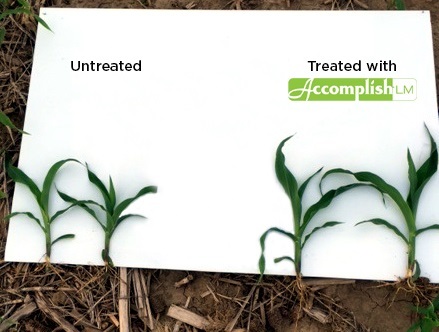 For growers who are applying a starter fertilizer this season, adding a fertilizer biocatalyst like Accomplish LM can be an excellent way to enhance a starter application and set the stage for a great yield. Accomplish LM works by speeding nutrient mineralization to get nutrients in the right form for plant uptake, while also improving the root systems of young seedlings to facilitate the uptake of nutrients and water. In these two trials in Nebraska and South Dakota, adding Accomplish LM to a starter fertilizer application increased corn yields by 8 to 10 bushels per acre. As we enter planting time and growers make final decisions for the coming crop year, many growers will consider using in-furrow products. There are several reasons why they should research and consider in-furrow applications. 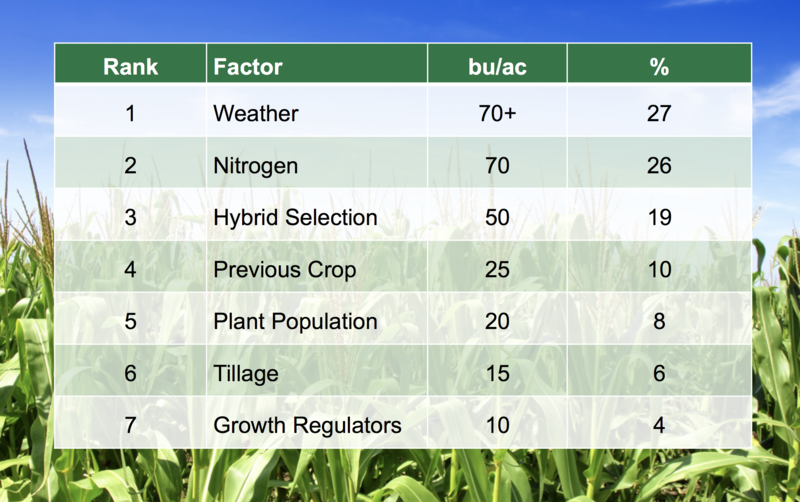 Many of you have heard Dr. Fred Below of the University of Illinois talk about his “Seven Wonders of the Corn Yield World.” As we look at the factors below, we can see that there is no silver bullet. Attaining a high yield truly takes a systems approach! 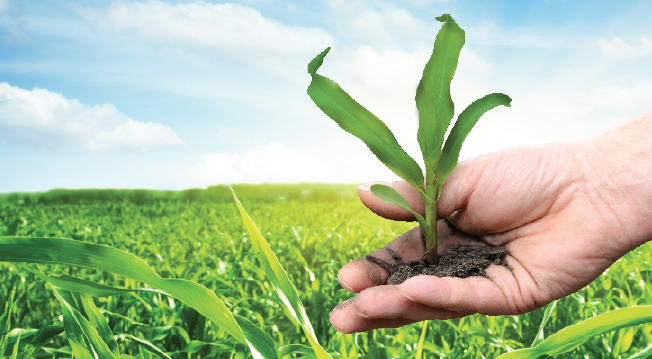 Growers use starter fertilizers to try to get plant nutrients in the right place at the right time for early plant growth. By applying small quantities of nutrients close to the seed in starter programs, growers can usually get their crops off to a good start—an advantage they can often maintain during the growing season. 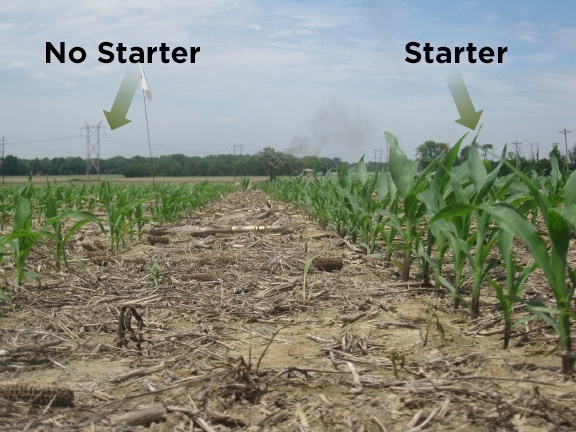 However, as with any fertilizer program, making sure that applied nutrients in a starter program are in a plant-available form right when the crop needs them most can be a challenge. How can growers improve the efficiency of their starter programs and realize the payoff of higher yields in the process? Growers know that uniform corn emergence is a must for achieving great yields. Recent research shows that a delay in emergence of just 12 to 14 hours can affect yield potential. In side by side field trials done in 2014 at three different locations and led by North Carolina State University cropping systems specialist Dr. Ron Heiniger, an in-furrow application of Accomplish LM promoted uniform corn emergence, increased row and kernel number, and increased ear weight by 1/8 lb compared to check (10-27-0 applied in a 2x2 band). 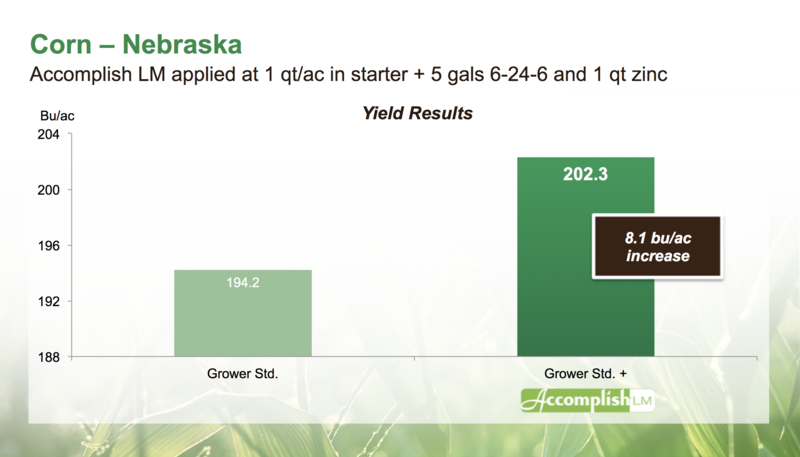 Uniform emergence was associated with higher yields: Accomplish LM increased the average yield by 11.5 bushels per acre. 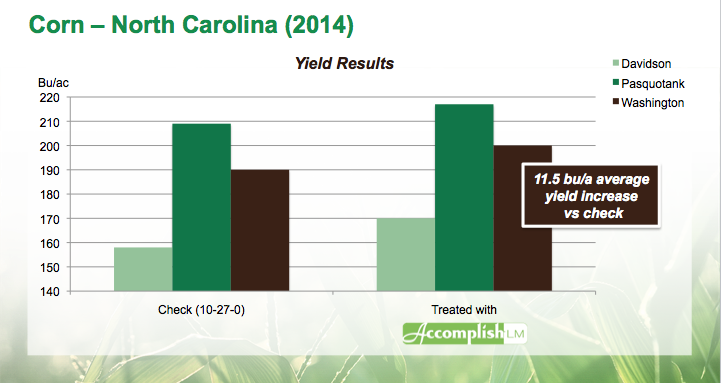 Accomplish LM is a fantastic tool for soybean growers who want to boost their plant health and performance. 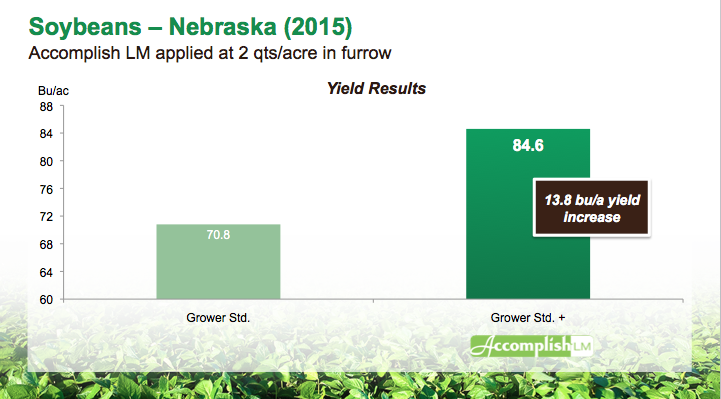 Recent harvest data from Nebraska show impressive results when Accomplish LM is used on soybeans in-furrow, with a 13.8 bu/acre soybean yield increase compared to untreated acres. This year, many parts of the country dealt with above-average to excessive spring rains. Wet conditions set the stage for denitrification (converting nitrogen in the soil system into N2 gas) and nitrate leaching, which may explain some of the yellowing growers have observed in fields where there has been a lot of moisture. 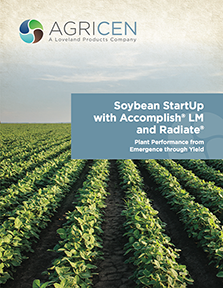 Soybean StartUp is a tank mix of Accomplish® LM and Radiate®, applied in furrow at planting. The goal is to get soybean plants off to a better, faster start and enhance productivity. In trial after trial, this program keeps giving a standout performance in the field. 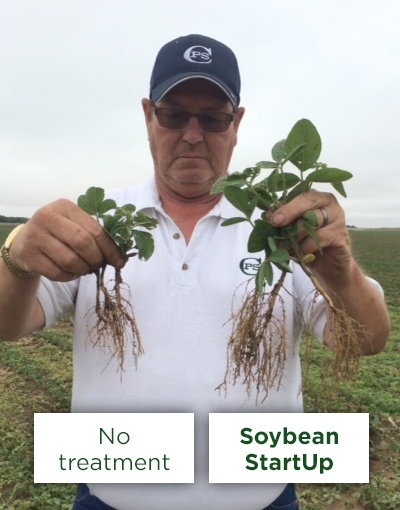 The soybean plants in the pictures below were planted on May 28th, 2015 in Greensburg, Kansas, by a grower who had trialed the Soybean StartUp program on half of his acres. The beans on the left were treated 2x2 with 10 gallons of 16-0-16-5 alone, while the beans on the right were treated 2x2 with 10 gallons of 16-0-16-5 and Soybean StartUp (1 quart of Accomplish LM with 4 ounces of Radiate in furrow). Pictures were taken mid-June. Soybean StartUp—a tank mix that consists of Accomplish® LM and Radiate®®, two of Loveland Products’ most advanced plant health technologies—is the industry’s first no-salt starter program for soybeans. This week, Loveland Products announced that Radiate® has received approval from the U.S. Environmental Protection Agency (EPA) for in-furrow uses with soybean, peanut and sweet corn crops.